Would you risk this happening to your skin? Relax. You’re in the safest of hands. This picture is an example of what can happen if Lasers or IPL machines are in the wrong hands. 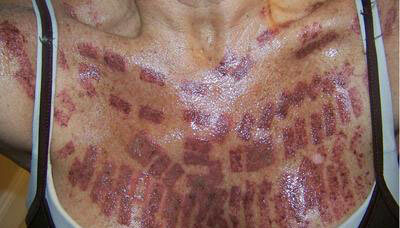 It shows a chest covered in burns where the equipment has been used incorrectly. This is sadly too common. We hasten to add we did not do this treatment. We do not use IPL here. Tragically we see cases like this, coming to us for help after a disastrous treatment elsewhere. We do not want this to happen to you. Your skin is precious so you need the right advice. The founder of this clinic pioneered laser treatments in 1991 working with leading scientists in the UK and is still passionate about effective laser treatments. We have been using lasers safely for over 25 years. We have unsurpassed experience and expertise in the technology and the techniques involved. The lasers we use are scientifically proven to work and we follow medical protocol for the delivery of all treatments. We will give you honest advice, even if that advice is to do nothing at all. We pride ourselves on having a meticulously clinical environment bringing the latest innovative treatments to our Customers and are focused on getting the best results for you. "From my very first consultation and throughout all of my treatments I have been very impressed by the level of professionalism and respect and consideration for what could be an embarrassing problem. I really feel as if my confidence has improved thanks to the treatment itself. The way I have been treated by everyone from the receptionist to each of the laser practitioners, it has been an enjoyable experience… and I never thought I would say that!! " Do you have a registered Laser Protection Advisor auditing your Laser Safety practices? Laser Safety Standards and Local Rules (our protocol for safe use of lasers) are set by our LPA (Laser Protection Advisor), formerly of Guys & St Thomas’s Hospital, who supports, audits and inspects this practice. Yes, Northampton Laser Clinic is fully insured. We have never had to consult our insurance company. Our practitioners collectively have over 35 years experience, specialising in laser treatment. What laser specific training do you have? Just being a nurse, a doctor or a beauty therapist isn’t enough. Laser specific training and qualifications are obviously vital. Firstly we work strictly under Doctor Protocol and our medical expertise ongoing is provided by Dr Paul Miles. As well as being a qualified Doctor/General Nurse/General Beauty Therapist, with a specialist interest in Dermatology and/or Aesthetics, medical laser specific training is critical for all laser operators. Training in laser safety first and foremost. Core of Knowledge covering laser physics, laser classification, equipment maintenance, hazards & dangers, and all elements of the MDA Guidance Document & CSA2000 to comply with National Minimum Standards. Dermatology in Laser Medicine, Laser delivery and associated side effects, Practical & Theoretical for each laser system in use and for each treatment being administered. Skin pathologies & Laser tissue interaction. All operators should be able to give sight of copies of their laser specific training certificates and regular updates. Sadly many new ‘start-up’ clinics have only had the engineer who delivered the machine brief them ‘how to use it’ and left a manual. All our laser practitioners meet qualification, laser safety and insurance standard. Our certificates are displayed in the treatment rooms for you to see at your consultation. Are your before and after photos your own work or copied from laser manufacturer brochures? We are very proud of our extensive portfolio of completely our own work. No other clinic can match it. Do you use laser or IPL or some other light source? We use medical grade lasers specifically designed for the purpose. Some places pretend they are using laser when they are actually using IPL (intensed pulsed light). The easiest way to identify IPL is the use of gel on the skin followed by a large handpiece that makes contact with the skin. Whereas lasers will have a cooling system blowing cold air on the skin simultaneously to a beam of light passing through the skin without the handpiece touching the skin and no gel required. You should establish what exactly the clinic you attend are using so you know you are getting the best treatment and value for money. Is the treatment you use the MOST effective treatment available? The medical grade lasers we use are the best available in the laser industry and achieve, without doubt, the best possible results.